The Crystal of the Day for Thursday 5 December 2013 is Lepidolite, which corresponds with Jupiter. Lepidolite was discovered in the eigtheenth century and was originally known as lilalite (from the Hindu word ‘lila’ meaning play, game). Lepidolite is not technically a gemstone, but a very beautiful purplish type of mica. It is referred to by healers as the Peace Stone. 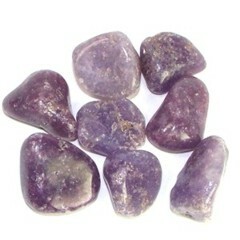 Some of the uses of lepidolite are: encourages independence for setting and attaining goals inconspicuously, protection from outside influences,relieves every day stress, and promotes restful sleep when placed near your pillow, attracts good luck to those who carry it, and drives away negativity, and when used with rose quartz, it becomes a stone of reconciliation of love.